Armer, Karl Michael (ed.). 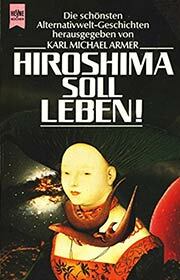 Hiroshima soll leben! Die schönsten Alternativwelt-Geschichten . Heyne 1990. Title trans. : Hiroshima Shall Live! Summary: German translations of Brian W. Aldiss's w88 android, George Alec Effinger's "Target: Berlin! The Role of the Air Force Four-Door Hardtop", William Gibson's "The Gernsback Continuum", Joe R. Lansdale's "Letter from the South Two Moons West of Nacogdoches", George R.R. Martin's "Under Siege", Kim Stanley Robinson's "The Lucky Strike", Lewis Shiner's "Twilight Time", S.P. Somtow's "Aquila", and Harry Turtledove's "The Last Article".